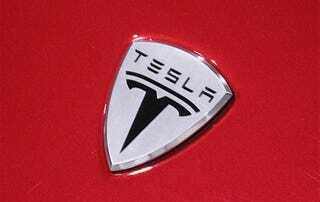 UPDATE In addition to announcing the Model S, Telsa boss Elon Musk has stated they hope to develop their technology to the point where future cars may be priced at $30,000 and below, but that won't be the case when the first models roll out in four years. So, no car, no price, no launch date. Nothing to see here, folks. Tesla, makers of the Tesla Roadster that hasn't yet seemed able to make it to market, have just announced plans for the Model S, a five passenger, all-electric "sports" sedan capable of 225 miles in a charge and a starting price in the range of $60,000. We have yet to see images of the car or details on the date, but the Governator himself was on hand to announce the Model S will be built in a new manufacturing facility somewhere in California. This was rolled out amidst new plans created by the California Air Resources Board to encourage zero emissions vehicle adoption. We'll pass on additional news as we get it, but for now the full press release is after the jump. Governor Arnold Schwarzenegger today joined with State Treasurer Bill Lockyer and Tesla Motors representatives to announce Tesla's decision to locate its new manufacturing facility for its Model S, Tesla's second-generation vehicle, in California. As part of the state's ongoing commitment to clean technology, the Governor also announced a new program that waives the sales tax on investment in new manufacturing equipment for Zero Emission Vehicles (ZEVs). This program was developed in conjunction with the State Treasurer and the California Alternative Energy and Advanced Transportation Financing Authority (CAEATFA). "Today's announcement is great news for California, our economy and our environment. We want these cutting-edge companies not to just start in California and do their research and development here-we want them to build in California," Governor Schwarzenegger said. "Tesla's announcement today is just one of many we will celebrate as we implement AB 32 and reach our greenhouse gas emissions reduction goals. I have always said that we must protect our economy and our environment at the same time, and today it is clear that we are once again demonstrating to the world how to do that." California's green-friendly atmosphere is encouraging clean businesses from around the world to invest in California, stimulating our economy and contributing to the fight against global warming. According to the California Green Innovation Index by Next10, a non-partisan research organization, in 2006 venture capital investment in energy technology companies in California was just shy of $1 billion, more than double the total from 2005. Last Thursday, the California Air Resources Board (CARB) released its AB 32 Draft Scoping Plan, the market-based roadmap which will guide California toward its greenhouse gas emissions reduction goals. This roadmap will motivate companies like Tesla to come to California and bring their innovation, reduced emissions and thousands of jobs with them. Last Wednesday, CAEATFA approved a new program that exempts new ZEV manufacturers from paying sales and use tax on the purchase of manufacturing equipment to encourage ZEV manufacturing in California. For Tesla, these incentives will mean millions of dollars in savings when the company invests in building their new plant in California. And if they choose a city that is in an Enterprise Zone, they will save millions more. Tesla will also be eligible for at least $1 million in Employment Training Panel Workforce Development Funds to train employees. Tesla's Model S will be a fully electric, five passenger, multi-use sport sedan with a driving range of approximately 225 miles on one charge. The projected cost of the Model S is $60,000. "These vehicles can play a big part in helping California successfully implement its groundbreaking laws to fight climate change," said State Treasurer Bill Lockyer, who chairs CAEATFA. "By offering this financial incentive, our goal is to ensure zero-emission vehicles realize their full potential in our state. In the bargain, we believe the policy will bolster our emerging green economy, create good-paying jobs and reduce our dependence on foreign oil. I'm very pleased the policy helped convince Tesla to build its high-performance electric cars in California." In addition, California's new Alternative and Renewable Fuel and Vehicles Technology Program, AB 118 by Speaker Fabian Nunez (D-Los Angeles), which the Governor signed into law last year, established a new program that will generate more than $100 million annually for development of new technologies, vehicles and fuels. Funding is expected to be available in March 2009. * Alternative Fuel Vehicle Incentive Program: Offers up to $5,000 for the purchase or lease of alternative fuel vehicles. Battery electric vehicles, such as a Tesla, typically receive the full $5,000 grant. * High Occupancy Vehicle (HOV) Lane Access: Vehicles are eligible to receive the white HOV lane access sticker allowing them to be driven in the HOV lane with only one occupant. This white sticker is different from the yellow stickers issued to hybrid vehicles in that their availability is not capped at a specified number of vehicles. * California's Environmental Performance Label: Requires all new cars starting in 2009 to display a sticker to inform consumers about the smog forming and greenhouse gas emissions of each vehicle. Vehicles are scored on a scale of 1 to 10, with 10 being the best. ZEVs will receive a score of 10 for both smog forming and greenhouse gas emissions. * Federal Tax Incentives for Recharging Stations: A federal tax deduction of up to $100,000 per location is available for qualified electric vehicle recharging property used in a trade or business. * Local Community Programs: Offers public charging, free parking and supportive building codes for installation of home charging units. * Low Carbon Fuel Standard: Requires fuel providers to reduce the carbon intensity of transportation fuels sold in California. This first-of-its-kind standard firmly establishes sustainable demand for lower-carbon fuels without favoring one fuel over another. To start, the standard will reduce the carbon intensity of California's passenger vehicle fuels by at least 10 percent by 2020 and more thereafter.